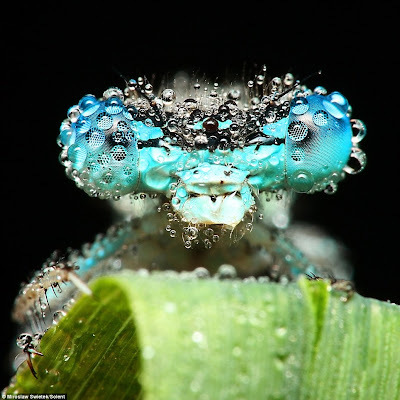 Miroslaw Swietek, a physical therapist in Jaroszow, Poland, has perfected the art of going out with a camera and flashlight in the early morning hours to capture stunning photographs of insects asleep and covered in drops of dew. That's a dragonfly resting on a leaf that you see above. Nothing else needs to be said: Swietek's photos speaks for themselves. But if you want to see more of his handiwork, The Daily Mail in Great Britain has several other "sleeping insect" images that Swietek has made. What an awesome study in hydrophobic surfaces! Look at the contact angle between droplet and bug. Plenty of coatings engineers would love to imitate these.